What? Barack and Michelle only have a month left in office? No! I still haven’t bought them a housewarming gift. I went to the White House and didn’t see a picture of Jesus having dinner with Martin, Malcolm, Tupac, Biggie and Harriet Tubman, so I was going to get a print for them to hang in the Lincoln Bedroom. Where did the time go? It seems like only yesterday, Republicans and conservatives were screaming, “Not my president” and vowing to obstruct the new commander in chief at every turn, and a scant eight years later, they’re calling it unpatriotic and hateful! Man, time really flies when you’re stabilizing the global economy, rebounding from the worst recession since the Great Depression, providing affordable health care to the entire country and killing the most wanted man on the planet! And what the hell are we supposed to do without Michelle? We’re supposed to just go all willy-nilly from an Ivy League-educated barrister to an Eastern European plagiarist whose facial expression always looks like she’s struggling to solve the Soul Train scramble board? That’s not fair to the American people. As a matter of fact, I think your math might be off a little bit. I swear it can’t be eight years already. Are you sure you counted all the days? Leap years, too? I don’t believe you. I’m gonna double-check. Yeah, you were right. It has been a whole eight years. I can’t believe this is happening. Barack and Michelle are really leaving. The White House chef is packing up the Lawry’s Seasoned Salt and everything! This hurts too much. The uncertainty is giving me the bubble guts. I feel like this is all my fault. I think we all took the Obamas for granted. Maybe we just assumed our next president would know that “bigly” wasn’t a word and that “Two Corinthians” is a couple of Greeks, but not a book of the Bible. Do you think Melania knows how to Dougie? You think Trump knows any Al Green songs or has any idea what “Hotline Bling” is? (Although I’m willing to bet there was at least one blond-haired white boy on his boarding school rowing team named “Drake.”) We didn’t appreciate them when we had them, and now that Michelle and Barack are almost gone, what are we to do? OK, maybe I’m a little upset. You know what, America? You’re damn right I’m mad! Most of all, I’m disappointed in all the white people. Now that you are faced with the prospect of returning to the era of dim-witted white men leading our country, you want to ask for a mulligan and change the Electoral College. Now, that’s white privilege! Maybe you didn’t know this, but ain’t no do-overs in the Constitution, bih! You screwed up royally! It was just eight years ago when we had a leader who achieved all of his success because of his daddy, and an evil, white-haired vice president running everything behind the scenes! You wanna go back to that? And I have to blame some of this on Barack Obama, too! He’s been president for eight years. He saw the political and economic morass he inherited and he knew these other pea-brained, privileged politicians had neither the intellectual heft nor the perseverance to lead this nation. He knows how fragile white people are. Donald Trump probably hasn’t sat on a toilet that wasn’t gold-plated since he was a toddler (when he had a platinum training potty), and Hillary Clinton fainted after spending an entire day sitting down. Sitting down! Do you know how many times President Obama probably had pneumonia these past eight years? None. Because he had s—t to do. Yet during these last eight years, Obama didn’t see fit to gather some of the best quantum physicists, theoretical engineers and molecular scientists to create a time machine that would allow him to go back to the past and clone himself. 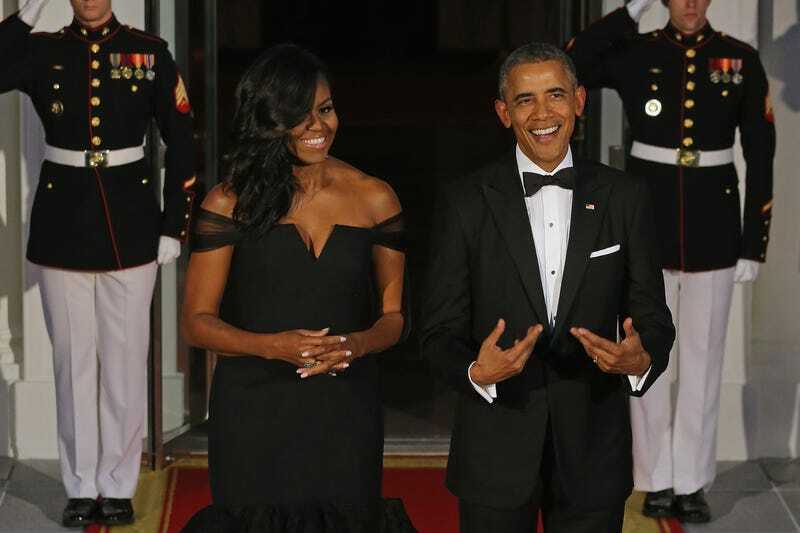 The fact that our next president and first lady aren’t named Darack and Rochelle Obama is a travesty, and I’m placing all of the upcoming failures of the Trump administration (of which there will be many) squarely on the shoulders of Barack Obama’s poor, non-time-machine agenda. I’m sorry. I know it isn’t his fault. Maybe I’m a little too emotional right now. As the end of the Obama presidency draws closer, each day gets tougher. Every morning I wake up wondering if this is the last day I’ll have health care. Every night I go to sleep knowing this may be my last because Donald Trump may wake up in the middle of the night and tweet something that leads to World War III. I already miss the Obamas so much. Sasha and Malia feel like a part of my family. Am I going to get to see my little cousins again? In my head, Sasha was always starting something and blaming it on Malia. I bet she tattled on Malia all the time, too. And just like the stronger, older sibling, Malia took it because she loved her little Sasha—even if she could be a little aggravating. See how I created that entire scenario in my head from nothing but press photos and imagination? That’s because for eight years, the Obamas allowed black people to dream. It wasn’t just about what Barack and Michelle accomplished that made them great. It was about what they represented. For every year of America’s existence, until a few years ago, the idea of a black president was—at most—a good, but too-outrageous-to-consider premise. It was for comedy sketches and science fiction movies. Then came the Obamas. An unblemished black man with a charming and successful black wife and a beautiful black family. They were an unbelievable possibility that actually came true and made us think anything was achievable. In a few weeks, the Obama portion of American history will come to an end. We think we are prepared. We are not. Maybe Barack Obama will go down as the first black president. Even though the country seems intent on regression, maybe America will progress. Maybe the wall of presidential portraits will one day be more diverse than 42 white men and that one black dude. Or maybe this is a moment in time we were fortunate to have witnessed. I can imagine, years from now, when I am sitting on the passenger side of my great-great-grandson’s anti-matter hovercraft, that he will turn down the satellite in-dash hologram machine giving us news about another police light-sabering of an unarmed black man, and ask me about the days of yore when we had a black president, and I will tell him about the two thousand, nine hundred and twenty days when a black man was the leader of the free world. How proud we were. How safe we were. How we prospered. Until that day comes, I will hold on to these last few moments and remember the past seven years, 10 months, one week and two days (not that I’m counting). I will not be rattled by the prospect of what is to come. I will not allow these last remnants of this time to be tarnished by hate or fear. When it is over, I will be glad I experienced it, and think back on it with a smile. But I’m gon’ cry in the car.